World Travelers of America:.Copper Canyon, Mexico - Adventure in the Wilderness! Learn about Copper Canyon, Mexico, by reading Copper Canyon, Mexico – Adventure in the Wilderness by Sandy Zimmerman, Travel Writer. It features a mini, but thorough tour of the destination, plus all you'll need to know to plan your trip including getting there, objective information on places to stay and eat, and things to do. At the end of the article, we've provided a summary of the contact information for your easy reference. Enjoy! At Copper Canyon, Mexico, the train is not just transportation; it is “the stage” for nature’s extraordinary show! The drama unfolds as each turn of the tracks leads to new surprises. The train continues twisting and climbing as it moves deeper and deeper into the untamed wilderness. You are afraid to look away, trying not to miss a moment of this spectacle. Your journey travels from sea level to 8,000 feet, through 5 climatic zones, 86 tunnels, 37 bridges, 6 canyons, cascading waterfalls, rivers, and over 408 miles of rugged terrain. This is a ride like no other, one which you will never forget! Here among the wilderness, Baldarrama’s Posada Barrancas Mirador Hotel is as exciting as it’s colorful name! Set within the mountainside, the Mirador is like a beautiful pink bird nesting on the rocks. We look at the views of the canyon and suddenly the scenery has changed. Are we in the Grand Canyon? The resemblance is uncanny and if their photos were compared, people would not be able to tell them apart. The Grand Canyon is around 1/4 the size of Mexico’s Copper Canyon and could figuratively fit into it. The canyon’s rainbow of blues, purples, pinks, and other hues are startling with every movement of the sun’s rays. Everywhere you step, there is a scene to capture with your camera. The Mirador is built Mexican-style with influences from the Tarahumra Indians. These shy Indians have the ability to run long distances and even outrun deer. 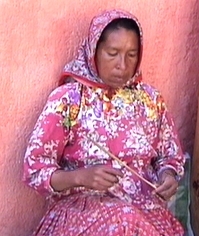 They are known as “people of the swiftly running feet.” The Indian women sit at the hotel’s entrance and around the village selling their woodcarvings, masks, baskets, jewelry, and other handcrafts. Living as their ancestors did for the past 400 years, the Tarahumra Indians stay in caves and other primitive dwellings. Just walk the 200-step mountain path next to the hotel and you can actually see one of their inhabited cave homes. The Tarahumara Indians perform ceremonial dances and demonstrate their running skills for the hotel guests. You can ride a horse around the mountain trails, hike, or take a sightseeing bus to the balancing rock, Indian shops, and see some breathtaking vistas. Although Los Mochis is the first stop for the Chihuahua al Pacifico Railroad into the Copper Canyon, you can spend a day or two enjoying the fun at the nearby Sea of Cortez. Their 2-hour yacht cruise of Topolobampo Bay brings us close to playful dolphins and hundreds of birds. If you want more activity, the all day tour to El Farallon Rock Nature Sanctuary lets you thrill to the antics of sea lions and also gives you time to go swimming and snorkeling. For a side trip, the Grupo Sematur ferry travels from Topolobampo to Las Paz. Choose from several first class accommodations and continental restaurants. The entire little town of El Fuerte is like a movie set with an 18th century church, fort, plaza, municipal palace, mansions, and other historic buildings. This colonial city, founded in 1564 along the El Fuerte River, was a major trading post for silver and gold miners. Just 1-1/2 hrs from Los Mochis, El Fuerte is a popular tourist destination. You will be surprised how much there is to see in this small town! Try bird watching along the El Fuerte River on the guided rubber-style raft tour- holds 8 passengers. Most hotels will give you a map for the self-guided, 1-2 hour colonial walking tour of the city. The closest petroglyph site is a 9-mile taxi or car ride to see the 1,500-year old Nahuatl Petroglyphs. Near the Tehueco (blue sky) Mayo Indian Mission, build in 1650, is the ancient Indian village of Capomos- around 1 hour from El Fuerte. Travel into foothills of the Sierra Madre Mountains to the silver mining town of Alamos- 110 miles, or a 3-hour drive each way. Tours usually stop for breakfast before catching the train, or stay overnight at the historic Posada del Hidalgo Hotel. The Hotel Posada del Hidalgo was built in 1890 by Senor Rafael Almada, a wealthy “alcalde” (mayor). The construction took 5 yrs and cost 100,000 gold pesos. The wooden trim, made from 285 Canadian red pine beams, was shipped by boat from San Francisco. His ironwork was brought from Mazatlan. Known as the largest and most beautiful mansion in El Fuerte, its VIP guest list includes Presidents Venustiano Carranza (1913) and Carlos Salinas de Gortari (1991). If you have time, see the 380-year old historic mansion, El Fuerte Lodge, restored by hunting guide Robert Brand. Its courtyard, waterfall, and architecture are enchanting. Travelers should be aware of this little known Mexican city because of its interesting attractions, business facilities, entertainment and gourmet restaurants. When you visit Hermosillo, don’t miss the exciting Museo Regional de Sonora. This museum served as a penitentiary for 70 years and dates back to 1907. While walking through the penitentiary, imagine the people who were incarcerated in these cells and underground dungeons. The building is well preserved. One section of the building is a museum featuring the geography, history, and culture of the region. There are three historic 18th century buildings in Hermosillo - Cathedral de la Asuncion, Palacio Municipal (city hall), and Palacio de Gobierno (governor’s palace). Stroll around the governor’s palace to see the murals in its tree-shaded inner courtyard. Kino Bay, called the pearl of the Sea of Cortez, offers fun in the sun- beaches, swimming, diving, snorkeling, wind surfing, water skiing, kayaking, sports fishing, shell hunting, and building sand castles. Just 65 miles west of Hermosillo, the ride should take around 45 minutes. Museo Regional de la Universidad de Sonora (Regional museum of the University of Sonora) has exhibits relating to the Yaqui, Mayo, Pima, Papago and Seri Indian tribes. Just 2 miles south of the city, the Centro Ecologico de Sonora (Sonora Ecological Center) is a zoological park with more than 500 species of plants and animals of the region. This is modeled after the Arizona-Sonora Desert Museum in Tucson. How Thick Do You Want Your Steak? Dine at a steak-by-the-ounce restaurant or any of the other fine restaurants featuring regional, international, Chinese, Argentinan, and Japanese cuisine. The city awakens at night with mariachi bands and other entertainment. Choose the route from Los Mochis or El Fuerte for wild, breathtakingly beautiful scenery. Because the scenery changes at the central point inside the Canyon, many people return to Los Mochis to experience the thrills again and catch their flights back to the U.S. We arrived in Chihuahua late and left the next morning so there is no information to add about Chihuahua. This trip is a thrilling eco-adventure with reasonable, first class accommodations, delicious food, and unforgettable tours. See the Details section for specifics that will help you plan your trip. Daily flights from Los Angeles, Phoenix, Tucson, and San Antonio to Los Mochis. Daily flights from Los Angeles, Phoenix, Tucson, San Antonio, and El Paso to Chihuahua. Aero Mexico (800)-237-6639. Flights from Los Angeles and Tucson (Wednesdays, Saturdays, and Sundays) to Los Mochis. Aero California (800)-237-6225. Reminder: Check rates and book your reservations – car and hotel – with WTA's Online Travel Booking Service . Savings can be as much as 30% off car rentals and 65% off hotels! Santa Anita Hotel- first class hotel designed with a European-style appearance. Restaurante Santa Anita (continental) - $8-25, even if you don’t stay at this hotel, try their gourmet dinners- shrimp shish kabob flambeed tableside and other specialties. Compares to gourmet restaurants in the U. S. Bar with entertainment, telephones and cable television in rooms, gift shop, business services, meeting rooms. Room rates - $110. Downtown, Ave. Gabriel Leyva and Hidalgo 81200; (800)-896-8196. The Grupo Sematur Ferry travels from Topolobampo to Las Paz. 9 hours. Cafeteria on board (68)-62-0141. Hotel Posada del Hidalgo - historic motor inn built in 1890, open-air restaurant, bar, pool, business services, meeting rooms, gardens, courtyards. Meals are not included. Don’t worry about staying in a historic building. This hotel is comfortable with first class accommodations. $60-120. On Mexico #15, NE of main plaza, downtown, Hildago 101 818200. (800)-896-8196, call after 9 a.m. weekdays. 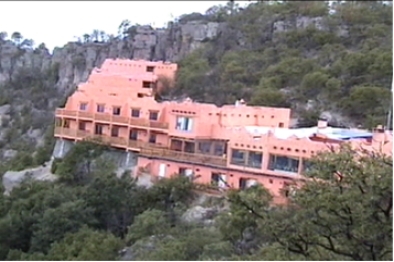 Rio Vista Lodge, on the Cerro de las Pilas, highest spot in El Fuerte. Rustic, furnished with antiques, continental breakfast included first night only, restaurant, and no credit cards. Under $60. (698)-893-0413 (Note: The author has not personally reviewed this hotel and restaurant yet). Hotel Posada Barrancas Mirador - magnificent views from their large terrace, dining room, lobby, and each of the hotel rooms’ private balconies. Bar, large stone fireplace in lobby, meeting room, Posada Barrancas train station stop. $162 includes 3 meals. (800)-862-9026, call after 9 a.m. weekdays. Fiesta Inn - 4 star hotel, near airport, 15 minutes from downtown, restaurant, bar, pool, gym, cable television and telephone in rooms, business center. $76-488. (800)-FIESTA 1. See website for special rates: www.fiestarewards.com. Sonora Steak House - Lunch or dinner. $4-20. Dine at the colorful Sonora Steak House Restaurant for a meal of chateaubriand, filet mignon, or any of the other tender, juicy steaks cut and weighed at your table. They also offer pastas, chicken, and fish selections. Tortilla soup is served with all the ingredients on separate plates so you can create a blend exactly to your liking- avocado, tortilla, cheese, and chilies, with a tomato base. On Mexico #15, hotel zone, Blvd. Eusebio Kino #914; (62)-210-0313. Mariachismo Restaurant - Nighttime should take you to the Mariachisimo! Restaurant for a feast of delightful carne asada served on platters family style. Named best restaurant in Hermosillo, they entertain with 11 piece Mariachi bands. Periferico Poniente 325, Colonia Palmar del Sol. Periferico Poniente # 325 Col. Palmar del Sol; 218/35-55. Museo Regional de Sonora - On eastern slope of Cerra de la Campana (Hill of the Bells). Overlooks the city. Jesus Garcia Final at Calle California, Col. La Matanza; 662/217-2714. Museo Regional de la Universidad de Sonora - Regional Museum of the University of Sonora. Calles Luis Encinas and Rosales. Hotel Sicomoro Chihuahua - Five star hotel, restaurant, coffee shop, bar, entertainment, pools, television and telephones in rooms, business center, meeting rooms. Blvd. Ortiz Mena #411, Unidad Presidentes, 31230; (800)-448-6970; www.sicomoro.com. Budget and Hertz have offices at the airport in Los Mochis. Avis, Budget, and Hertz have offices at the airport in Chihuahua. Avis (800)-331-1212; Budget (800)-527-0700; Hertz (800)-654-3131. Reminder: Check rates with WTA's Auto Rental Discount Program. Savings can be as much 30%! Daily schedule: Catch the train in Los Mochis at 6 a.m. or in El Fuerte at 7:26 a.m. Arrive in Chihuahua 15 hours later. It’s advisable to schedule stopovers inside the canyon along the way. First class $110 and second class tickets $56 each way. The second-class train leaves 1 hour later. You can drive to Chihuahua via Mexico Highway 45 from the El Paso - Ciudad Juarez border, around 233 miles. Paved roads connect Chihuahua City to Creel and Divisadero inside the Copper Canyon. Take Mexico Highway 16 west to San Pedro, then State Highway 127 south to Creel. If you drive to Los Mochis, leave your car there because the first part of the Copper Canyon can only be traveled by train. S & S Tours - (800) 499-5685; www.coppercanyon.com. Xplore Vacations - sells only through travel agents; http://www.travelcats.net/d/31738_7977.htm. Aero Mexico Vacations, (800)-245-8585; www.aeromexicovacations.com. Balderrama Hotels and Tours - Pioneers of the Copper Canyon region since it opened in 1961, the Balderrama hotel chain and tours extend from the coast of the Sea of Cortez through the Copper Canyon. (800)- 896-8196; www.mexicoscoppercanyon.com. If you are not traveling on a package tour, the hotels usually can arrange tours at each stop. Since this is an “off the beaten path” vacation, check to see whether the tours are being offered during the time of your stay. Mexican Tourism Board - Copper Canyon information. (800)-44-MEXICO; www.visitmexico.com. U.S. And Canadian citizens are not required to have a passport to enter Mexico. They must show a certified birth certificate accompanied by a government issued photo I.D. To contact the police, fire department, or an ambulance in Chihuahua or Los Mochis dial 060. For medical problems contact the Red Cross, local hospital or clinic. Red Cross - Los Mochis, 668/815-0808; Chihuahua, 614/411-1619. Hospital Santa Rita - Los Mochis, 668/815-4800. Hospital del Centro del Estado - Chihuahua, 614/415-9000. Pharmacies: Farmacia Internacional - Los Mochis, 668/812-5556; Farmacia Cosmos - Chihuahua, free delivery, 614/812-9660. Notice: This information is current as of August 2003. It is recommended that you contact the numbers, and/or visit the above to determine any changes to the information.